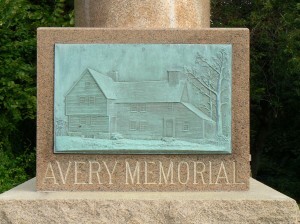 A large monument in Groton marks the original homestead of the local branch of the Avery family. 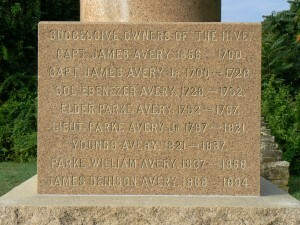 The monument, near the intersection of Poquonnock Road and Route 1, marks the site of the “Hive of the Averys,” where Captain James Avery built a homestead around 1650. 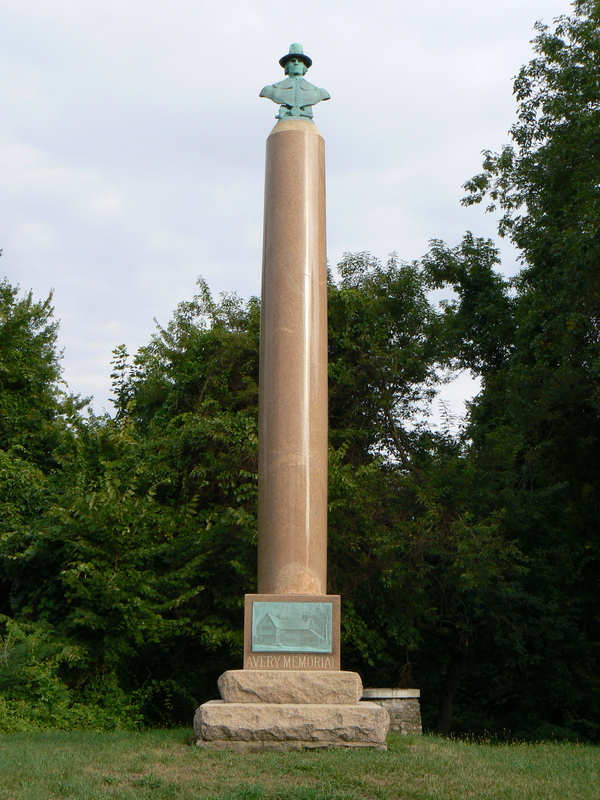 The site features a tall column topped by a bronze bust of Avery. A bronze plaque on the front (southeast) face of the monument’s base displays an image of the house. The northeast face lists the eight owners of the house between 1656 and 1894. 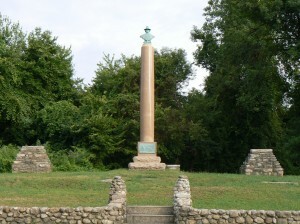 The northwest face says the monument was built in 1895 by the Avery Memorial Association. 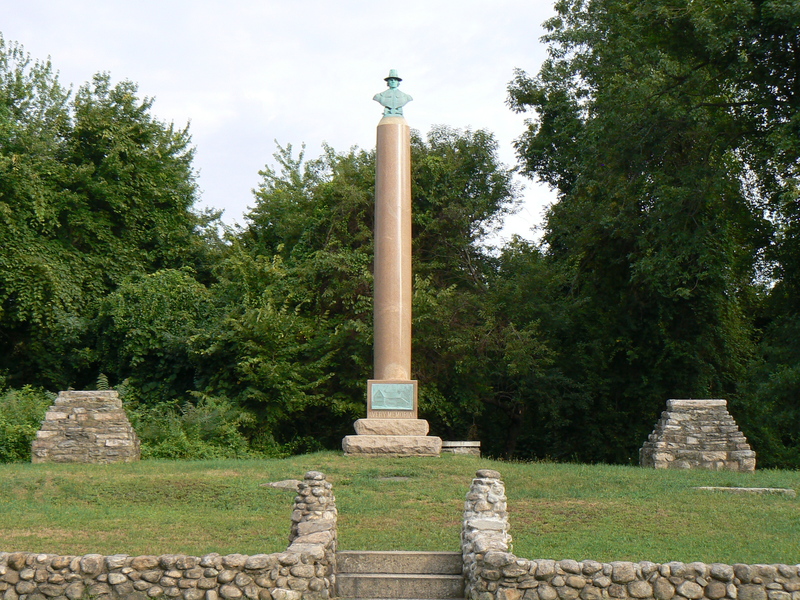 The southwest face of the monument’s base bears an inscription reading, “This memorial marks the site of the home built in 1656 by Captain James Avery, the founder of the family now known as the Groton Averys. This Hive of the Averys was owned and occupied by its famous builder until his death. Steps from the original house and several other features can be seen at the site. Captain James Avery moved to Groton from Gloucester, Mass., around 1650. 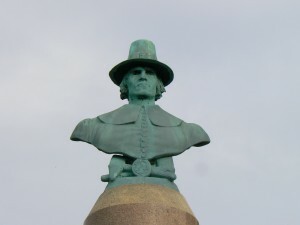 In 1656, he commanded a company of Englishmen fighting Native Americans, and in 1684, he expanded the house. For the next 230 years, eight generations of Averys lived in the Hive. The arrival of the railroad to Groton ultimately meant the end for the Avery homestead. In 1894, sparks from a passing railroad engine set the house’s roof on fire, and the home was destroyed. At the time of the fire, James Denison Avery was serving as Groton’s town clerk and, according to the custom of the era, recorded transactions and stored the town’s land records in his home. Fortunately, bound transaction volumes were protected in fireproof safes. 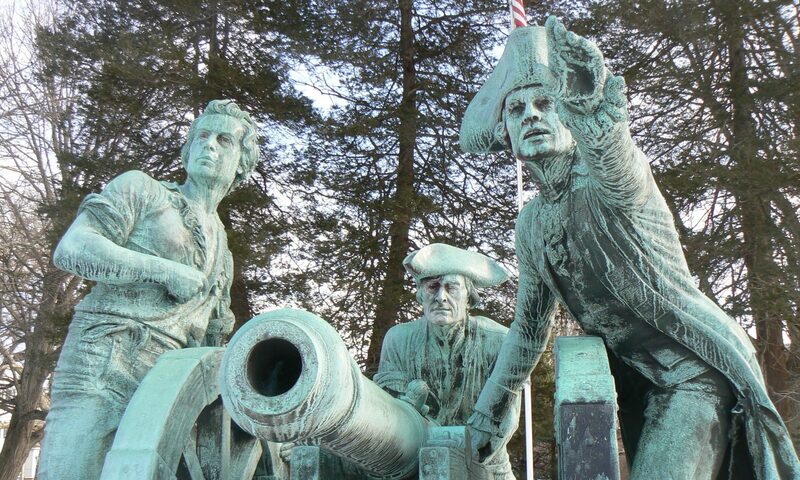 The monument was created by sculptor Bela Lyon Pratt, whose works included the Nathan Hale statue at Yale University. More information about the Avery family, which has long been active in civic and business circles, at the Avery Memorial Association’s website.